Step 1: Prepare the fish. Heat half of the olive oil in a frying pan. After that, season the fish with salt and pepper and flour it. Place the fish in the frying pan and fry it for 3-4 minutes on each side. When ready, remove it from the frying pan and lay it in an ovenproof or ceramic dish. Step 2: Prepare the marinade. Throw away the oil you used for frying the fish and wipe out the frying pan using some kitchen roll. Heat the remaining olive oil. Add the onions, garlic and fennel seeds and sauté for 5-6 minutes, until soft. Pour in the wine and elixir, season with salt and pepper and allow to boil a bit. Finally, add the currants and sun-dried tomato paste, mix well and boil for 5 minutes. Step 3: Remove the frying pan from the heat and set the marinade aside for 5 minutes to cool a bit. After that, top the fish with the marinade and wait for the fish to cool too. Step 4: Serve the Ionian fish dish (mpourdeto) cold. An exceptional mezé from the traditional cuisine of the Ionian islands. 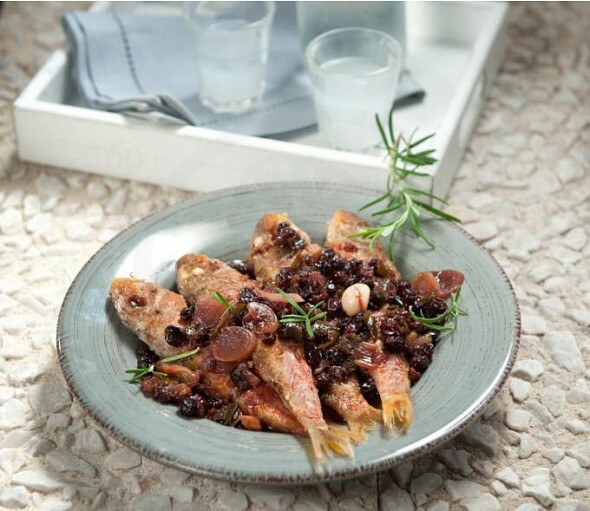 This recipe combines perfectly fresh fish with herbs and high quality vinegar and wine to create an incredible appetizer!